Kumon is an education network that started in Japan that now has locations worldwide. There are at least a dozen in Los Angeles County alone and for the past several years we’ve been helping different locations with many different types of signage. We had done some signage for the Northridge location in the past, one of them being exterior window graphics. All signage needs to be replaced or refurbished eventually, and window graphics are no exception. Especially in the Los Angeles sun, it’s inevitable that your exterior vinyl will lose color or start peeling over time. Pre-colored vinyl fades a little slower than digitally printed vinyl, but it will need to be replaced eventually and you have limited color choices. 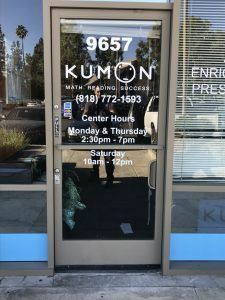 Kumon in Northridge asked us to remove the existing window graphics, and create new ones to replace them. The yellow stripe at the top and the white lettering on the windows were holding up well so we only redid the bottom blue stripe and the door graphics. The placement of your vinyl also affects how much people are going to touch it, how much dirt is going to touch it, and how much sunlight will reach it on a daily basis. 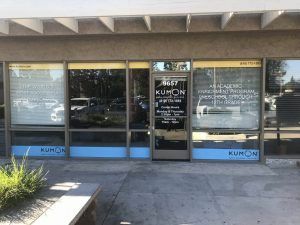 Kumon’s branding uses a very specific blue which is what we digitally printed for the bottom stripes, along with the company logo and tagline. These were gloss laminated and installed 1st surface, on the outside of the glass. We’ve made similar window graphics for Supercuts stores. It’s a great use of window space and great for branding, especially if you’re a well-known company. The door graphic was mostly white vinyl lettering. Again, we replaced the existing vinyl with the exact same information. For the most part, door graphics all have the same information. The company name/logo, some form of contact information, and business hours. Kumon also included the address number which is great for someone that’s looking for your location for the first time. Depending on your business and how you want people to contact you, you can put your phone number, E-mail address, or any other contact information. For example, some businesses may also include their social media handles if they advertise heavily on social media and want to gain more followers. If your business has visual aspects and you have a lot of galleries on your website, you’ll probably want to include your website link. Lastly, posting your hours can be very helpful to someone who shows up outside of business hours. They can quickly and easily get information on when they should come back.